The module, built by manufacturer Bigelow Aerospace, has precedent in the earliest NASA designs. NASA has announced today that they are awarding a $17.8 million contract to Bigelow Aerospace to manufacture an addition to the ISS. 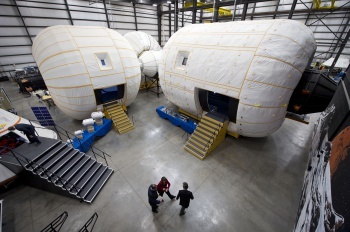 The expandable module, which will quite literally inflate, is a followup to Bigelow's own Genesis I and Genesis II spacecraft, inflatable stations launched in 2006 and 2007. "This partnership agreement for the use of expandable habitats represents a step forward in cutting-edge technology that can allow humans to thrive in space safely and affordably, and heralds important progress in U.S. commercial space innovation," said NASA Deputy Administrator Lori Garver. Bigelow Aerospace's mission is to "Provide affordable options for spaceflight to national space agencies and corporate clients." There's currently no date for when the Bigelow Expandable Activity Module will reach space, though NASA intends to release details within the next few days at a joint press conference with Bigelow. While the concept of an inflatable ISS module may sound ridiculous, inflatability actually dates back to the first days of space travel, when space in a rocket was at an absolute premium. Project Echo was an early 1960s NASA project that launched the Echo I and II spacecraft, giant metalized balloons nearly the size of ten story buildings. The Echo spacecraft were passive communications satellites used to bounce microwaves from one point on earth to another. Their purpose was totally not to get a better fix on Moscow for the launching of intercontinental ballistic missiles.